Les Couronnes du Nord Comprenant Les Royaumes de Suede Danemarck et Norwege divisees par Provinces et Gouvernements. 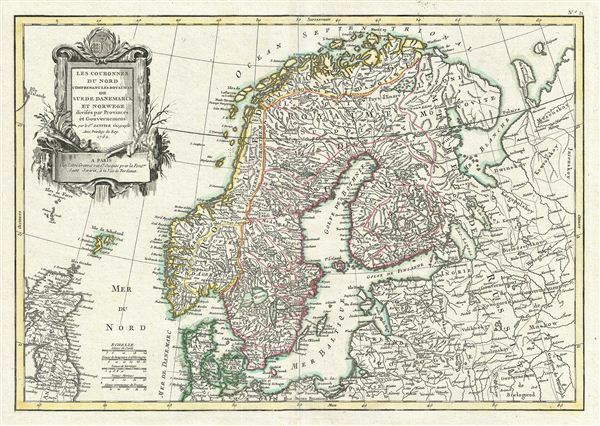 A beautiful example of Jean Janvier's 1762 decorative map of Scandinavia. Janvier's map covers from Iceland and england eastward as far as Moscow, north to the Arctic Sea, and south as far as Denmark and Germany. The map includes the modern day nations of Sweden, Denmark, Norway, and Finland. Towns, cities, rivers, mountains, and some undersea features are identified. Of particular interest is the legendary Lofoten Maelstrom in northwestern Norway. This legendary whirlpool was the inspiration for edgar Allen Poe's classic short story Descent into the Maelstrom. In reality, it is a periodic and powerful current caused by tidal variations in the region. A large decorative title cartouche appears in the upper left quadrant. Drawn by J. Janvier c. 1762 for issue as plate no. 21 in Jean Lattre's 1783 issue of the Atlas Moderne. Rumsey 2612.043. Phillips (Atlases) 664. National Maritime Museum, 215.